I did this walk on Sunday 15th February 2009. There was lay-by besides the A1060 very close to where I had finished my last stage of the walk however I was a bit unsure about leaving my car there as it was a rather remote spot so I went and parked in Good Easter itself. From there I walked back over the fields towards the road to resume my walk along the Essex Way from the appropriate spot, a walk of just over a mile, including the muddiest stretch of field I had to walk over all day. Back on the Essex Way I continued along the farm track towards Good Easter, photo 1, where almost all the snow from the previous week had now melted making the landscape look quite different. 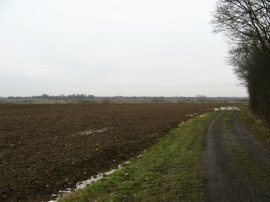 The track heads gently downhill between fields to join Farmbridge End Road. 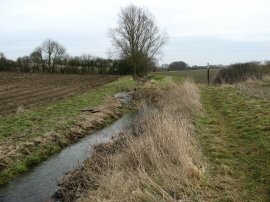 The path crosses over a bridge and in the fields on either side of the stream there was the signs of recent flooding, the ploughed earth being smoothed much flatter although now the water was well back within its banks. 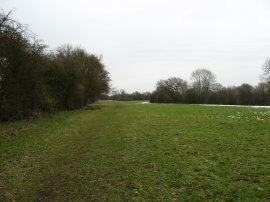 The road is followed for a very brief distance before taking a footpath on the left that runs along the bottom of a field, parallel with the stream before turning to the right at the field edge. Where the hedge ends the route then headed directly across a very muddy section of ploughed field, photo 2, to reach the churchyard of St Andrews Church at Good Easter. 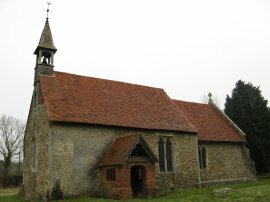 This is an attractive church with a tall wood lined tower and shingled spire, photo 3. From the churchyard the route heads to the left down Souther Cross Road before turning right into Mill Road. After a couple of houses the Essex Way joins a footpath on the left that heads out to run alongside fields, initially behind the houses of Mill Road which had very short back gardens between the houses and the path. This signposted stretch of path was a slight deviation from the route of the Essex Way as marked on my map, avoiding a bit of road walking. Leaving the houses the route then heads across open fields, climbing ever so gently uphill to join a minor road. Here the Essex Way turns to right, following the road around a couple of bends before heading to the left down a broad well surfaced byway known as Hayron's Lane, photo 4. Where the lane turns to the left the route takes a footpath on the right that runs along the edge of a couple of narrow grassy fields, photo 5. The route leaves the fields over a stile to join a rather muddy tree lined lane that is followed up to a road by Stagden Cross Villas. Here the route turns right following the road past a junction on the left and on past a couple of fine houses before joining another byway on the left. At first the byway was enclosed by trees but later passed through more open farmland. 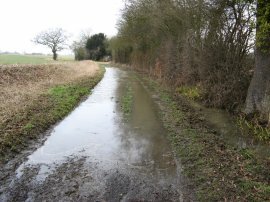 The byway had recently been used by a number of motorcycles and the surface of the path was very soft and muddy as a result. I was particularly annoyed to note that some of the bikes had ridden along the slightly raised green margins of the byway leaving no decent space to walk along. Eventually the byway reaches a farmhouse and joins Grange Road where the route turns to the right. 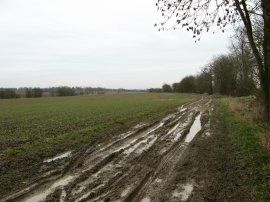 It was pleasant to be walking along a decent surface however the route soon joins a tree lined bridleway on the right that heads off between fields and once again I was walking on a very muddy surface. 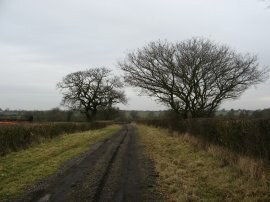 The bridleway runs down to join a road on the outskirts of Pleshey where the Essex Way turns to the left. 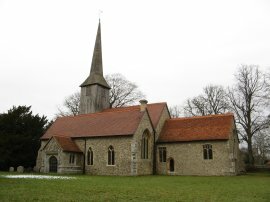 I stopped for a little rest before making my way into the village, passing the imposing Holy Trinity Church, photo 7. Continuing through the village I then passed the site of Pleshey Castle. The following is taken from the Wikipedia entry for the site: "Pleshey Castle was originally a motte and bailey castle, which consisted of a wooden palisade and tower on a high man-made hill (motte) surrounded by two baileys (castle yard or ward), which at some time in the castle's early history was surrounded by a moat. Later, probably in the 12th century, the motte was fortified with a stone castle. 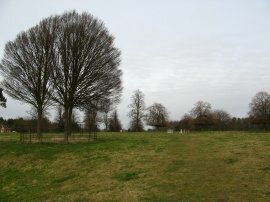 The motte at Pleshey is now about 15 metres high, and is one of the largest mottes in England. The castle was dismantled in 1158 but was subsequently rebuilt at the end of the 12th century. After the castle had passed to the Dukes of Gloucester through marriage and the current Duke had been executed by Richard III in 1397, it decayed and became ruined. Most of the masonry was dismantled for building material in 1629, leaving just the motte and other earthworks". Despite its historic interest the remains did not appear very photogenic and I did not take a photograph which probably was a mistake given their significance. Reaching the edge of the village the route joins a footpath that runs alongside the edge of Walthambury Brook, photo 8, which the Essex Way follows as it makes its way through fields almost all the way to Great Waltham, a distance of about two miles. Approaching Great Waltham the route crosses a minor road, Bury Lane, where the ford across the brook was showing a water depth of two feet, photo 9. Once again sections of the path had been very muddy and I stopped at the ford to try and wash some of the mud off my boots although it did not make much difference. From the ford the route heads alongside a couple of more fields to reach the village of Great Waltham. 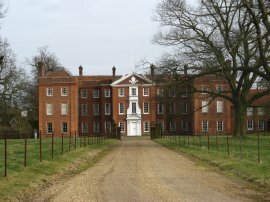 Here the Essex Way crosses over a road and passes through a white metal gate to enter the parkland surrounding Langleys House, photo 10. 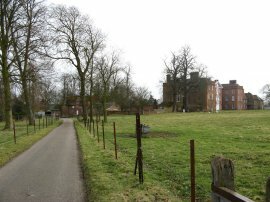 The path heads across the parkland, over a driveway and on to another driveway which is then followed off to the right. A short distance down this driveway, photo 11, is where I finished my walk along the Essex Way for the day. The total distance I had walked at this point was 9.41 miles of which 8.33 had been along the Essex Way itself, a distance I was quite satisfied with and one that will keep me on course to complete the walk in eleven stages. Leaving the path I headed over a stile on the right that took me past the front of Langleys House, photo 12, to a join a driveway that led into Great Waltham as I began my walk back to the car at Good Easter. 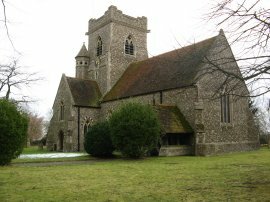 I passed round the edge of Great Waltham, stopping at a bench in the playing fields to eat my sandwiches although I did not stop long as it started spitting with rain and it then continued to rain or drizzle for the rest of the walk. I followed a footpath that headed in a generally westerly direction alongside a small stream. 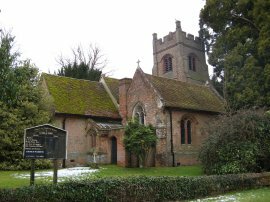 From Great Waltham I crossed over Hoe Lane and continued on, passing round a small lake, to reach another road where I joined a bridleway near Fanners Green which I followed round to join a road by Beadles Hall. 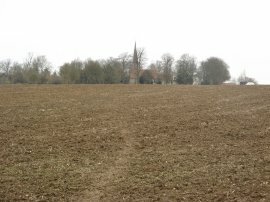 From there I then followed the road to the small village of Chignall Smealy where I passed the church of St Nicholas, photo 13. 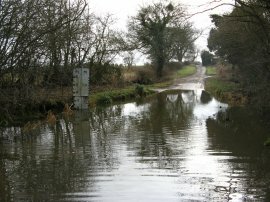 Just past the church I continued ahead along another bridleway, photo 14, which was quite flooded in a number of places. This lead to another stretch of road which I followed until the road turned to the right before continuing ahead over fields to reach the hamlet of Mashbury. Here the footpath runs past a disused church, photo 15, before passing by a stables. I then followed a track that ran through the farm before joining a footpath that headed over a field to reach a small patch of trees where the footpath disappeared, the only section of path I had problems with all day. Although the section of trees was narrow it was completely overgrown and I had to divert around the edges of the trees before continuing on to join a road. Here I turned to my left for a short distance before following the road round to the right into Wares Road. This then runs into Souther Cross Road which I followed all the way back to the car at Good Easter. I had originally intended to walk a bit more on the footpaths in this area however it was quite rainy and my legs were once again a little tired from the muddy ground I had crossed earlier in the day so I took the more direct route back. 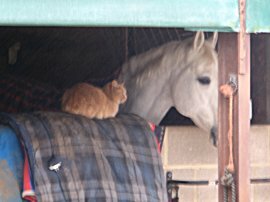 As I was passing the stables at Mashbury I spotted the cat and horse in photo 16 sitting together by the stable door. When I first saw them the horse had its head resting on the blanket on the door with the cat leaning against him however when I stopped the horse lifted up his head which spoilt the photo a bit. It did still look quite cute though. Reaching the car I had walked 15.6 miles altogether. Much of this section of walk had been along byways and although I did not encounter any traffic while I was walking aside from a few motorcycles the surfaces of the paths were often quite muddy due to their use by vehicles which at times made for slow and rather muddy progress. Hopefully this should become much less of a problem as the weather starts to warm up. The recent cold weather has also taken a toll on my walking boots and I noticed as I was heading back to Good Easter I noticed that the sole at the heel of the right boot was starting to come away from the upper which is a shame as the boots are in generally good condition and even after a 1000 miles of use do not appear that worn elsewhere. Below is a google map of the walk, the red line is my return route from Great Waltham.